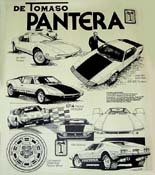 For all those who, like myself, race(d) De Tomaso Pantera GR4 factory cars or replicas, or even GR4/GT4 tribute street cars, it has been an nightmare to find the original Campagnolo rims that were used in period for the factory cars (1972) . As a solution, many of us use 13’’ rear wheels ( from street GT5 or GT5-S) at the rear but those also are almost impossible to find, and are one inch too small compared to the real factory 14-inch magnesium GR4 wheels. The 14’’ wheels also do a better job filling out the fenders without requiring spacers. Additionally, being in magnesium alloy, if they were not cared for properly, those original wheels may have become porous or even dangerous : they might crack and break because of oxidation, magnesium wheels’ worst enemy. Campagnolo went bankrupt a long time ago. The only remaining solution was to buy original wheels from people who wanted to get rid of them, or, alternatively, BBS, Gotti or other non factory wheels. Those wheels also, are very scarce, and expensive, and don’t come on the market very often. I have investigated for many years, the possibility of having new magnesium wheels reproduced without any success, up to very recently. 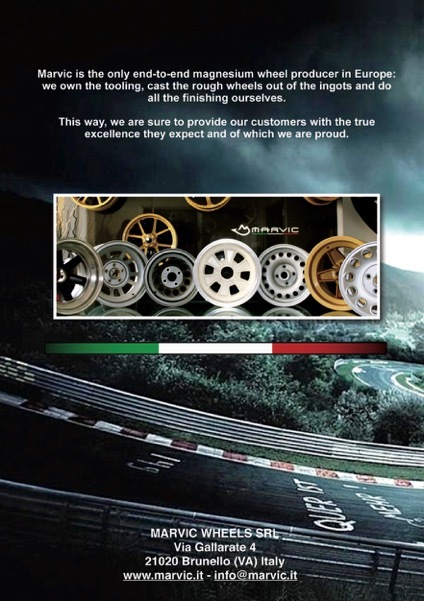 I have now been able to identify a foundry in Italy, Marvic Wheels SRL (http://www.marvic.it/en ) which has agreed to reproduce the original Gr4 wheels ! This foundry has been producing race wheels since 1954. They also produce and sell high-quality castings for companies like BBS ( magnesium centers) , Dallara ( Formula Indy, Formula 3000 and GP2) and Oak Racing (2013 WEC , LMP2 World Champions). The moulds are being created at present, and the first batch will be released early march 2014, i.e. a little less than two months from now, just before the racing season starts. Technical characteristics : Dimensions are the exact reproduction of the original wheels, used on factory group 4 cars in period : in fact, the foundry has had access to the original Campagnolo drawings, and double-checked with my « Candy car » original wheels . For the front : 10x 15, and for the rear 14x15. 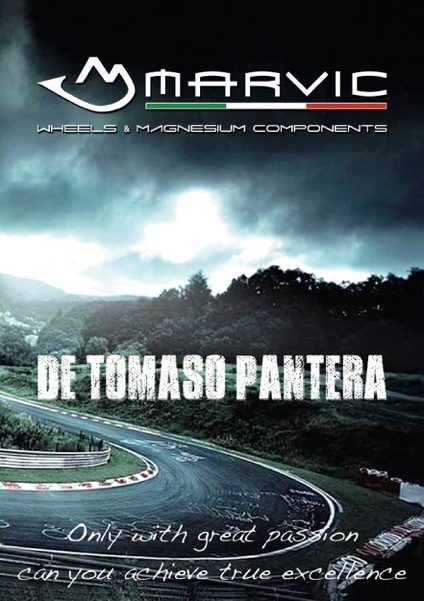 These wheels will fit factory GR4 or GT4, factory GR4 tributes, GT5 and GT5-S Panteras. Sand cast in AZ91 magnesium alloy – the best there is for racing - and using same original dimensions/thickness and so on . They come complete, ready to bolt on, completely heat treated for strength, with a surface treatment against oxidation, quality checks, machining, steel bushings inserts for the wheel lugs and painted original silver or gold. Weight per wheel is expected to be as follows : front 6.9 kilos ( 15.18 Lbs) , and rear 7.8 kilos ( 17.16 Lbs). There will be one major improvement compared to period wheels : they will have, inside the rim, a slight marking to prevent tyres to rotate on the rim when cold and at a low tyre pressure ( a thing I have experienced with my own wheels at Le Mans Classic, destroying a brand new slick tyre in the free practice first lap). The wheels carry no « Campagnolo » marking. 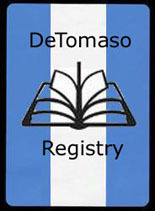 They will carry the foundry’s mark, but on the inside of the rim, making it therefore very hard to identify from the outside of the car, whether it is a « Campagnolo » period rim, or a new rim. Technical data of the batch production shall be engraved in each wheel for further control if need be. Down payment invoicing and balance shall be done directly by the foundry to the final customers. I am in charge of the marketing and follow up, on an exclusive basis. Payment conditions are as follows : 40 % upon ordering, with the balance due when the wheels are ready for shipment. In agreement with the foundry, I will coordinate the whole process and keep all buyers informed in a timely manner. 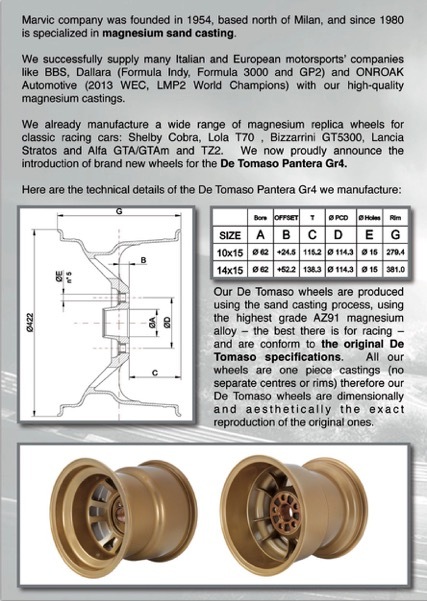 See you soon, with state of the art, brand new magnesium tribute wheels ! For more info : patrickhals@gmail.com or +32.476.567.898.